← Pick of the Week: Sad Santa Story Told in Six 1906 Keystone Stereo Cards – Or a Real Nightmare Before Christmas! For many years very few Americans seemed to be aware of some of the stranger characters associated with Christmas in other countries around the world. Every country has their own traditions, and ours are rather tame compared to most. All in all, our version of Santa is pretty darn nice. The worst thing he would ever do to a kid is put coal in his or her stocking for being bad. Coal in your stocking is no fun, but when you compare it to alternatives like being hit with switches and thrown into hellfire, I know I would happily take the coal. In recent years there has been a growing awareness of the Austrian Christmas villain, Krampus. If you haven’t heard about this lovable fellow, he looks like a devil with a very long tongue, and his sole job on this earth is to spend one day of each year, December 5th, punishing naughty children with blunt instruments (or giving switches to the children’s parents so they could do the punishing). Often the way to tell a Krampus from a regular devil is that the Krampus will often have black skin (the literal color black, this isn’t a race thing), though sometimes he is a more typical red devil. He will also most likely have a very long tongue to lick children with, and be carrying switches, shackles, or a basket on his back to carry children away to Hell in. Krampus is St. Nicolas’s sidekick in Austria, and while in America Santa doles out both gifts and punishments, Krampus does all of the dirty work while St. Nick only gives presents to good children. Krampus has been growing in popularity in America in recent years, and now several cities around the country celebrate Krampusnacht, or have a Krampuslauf (running of the Krampuses). 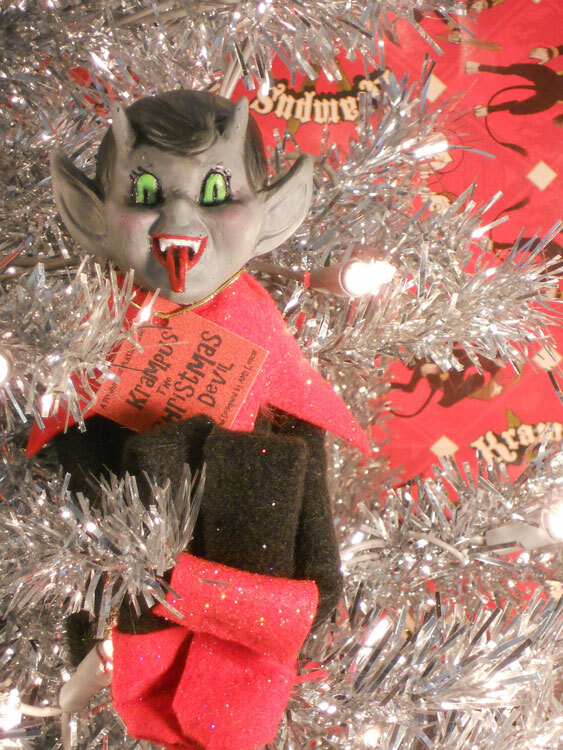 Krampus has been immortalized through Christmas decorations and postcards for many, many years, and every now and again we have been lucky to come across some Krampus memorabilia. I can try to describe Krampus to you with words, but the best thing I can do to introduce this ominous Christmas character, is to show him to you. One of the most popular Krampus collectibles is Krampus postcards. Krampus became a very popular subject for holiday postcards in the mid-19th century as postcards became a huge craze in Europe. Even though Krampus’ job was mostly to punish and scare children, many postcards of Krampus exist that show him reacting more to the sins of adults. The only card I have obtained (because Krampus postcards can get mighty expensive) is this one from about the 1960’s. It is a great card with a sort of child Krampus sitting on a pretty girl’s lap. Clearly, this Krampus is being seen as a more humorous figure than a scary one, and this card was made for adults to send to one another. Another thing to note about Krampus is that, because he is an Austrian figure, almost everything you find with Krampus on it is in Austrian or German. “Grub vom Krampus” translates to “Greetings from Krampus”, and is found on almost every Krampus postcard you find. This next Krampus piece I have is a paper cutout of the Christmas devil himself. 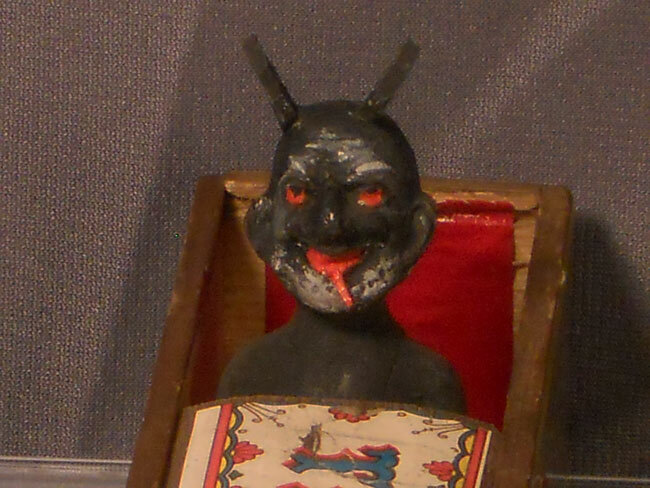 He is seen here with red skin, but the switches in his hand, the shackles, and the tongue let you know that this is Krampus, not an ordinary devil. Paper cutouts were used for a variety of purposes in decorating, and there are several designs out there that are being reproduced today. This piece is one of the more common Krampus pieces that I see, so it is a little bit more affordable for a new Krampus collector. I found mine in a local shop, but they show up on eBay fairly regularly. 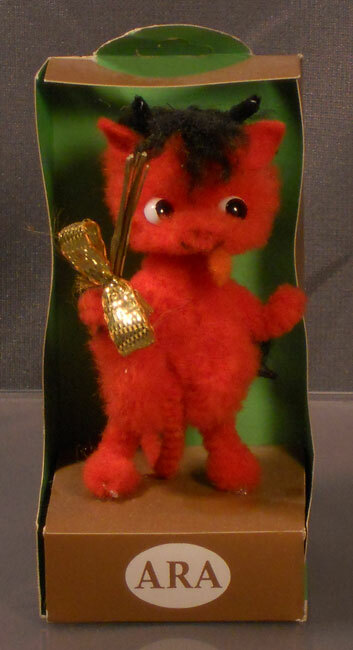 Little fuzzy animals made in Austria similar to this fellow were very popular in the 1960’s, so it isn’t too surprising that they produced a Krampus. 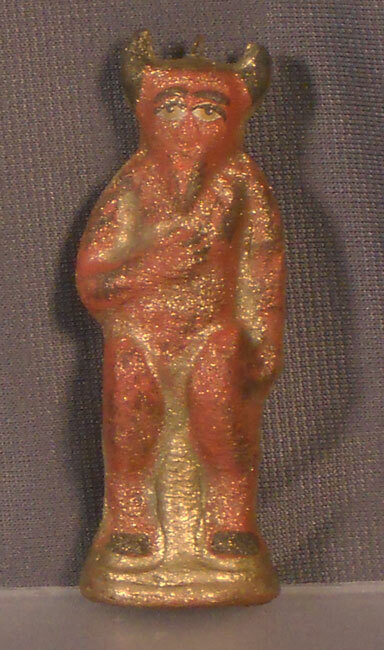 Again, this is a red Krampus, but you still know it is him because he has a little orange tongue sticking out, and switches in his right hand. This might be the cutest Krampus ever made. There is nothing imposing about this little guy at all. He stands about 4 inches tall, which is fairly large for the little creatures made by the ARA company. Clearly Krampus took on more of a comical role in the 20th century, which is why some of these cuter and less ominous Krampus items can exist. My mom found a few of these Krampus ornaments at a flea market. The dealer she got them from said he bought them in the Czech Republic. They are really cool, but pose a bit of a mystery. This ornament is made in the Dresden style, but looks awfully clean and new for a vintage ornament. I have always heard talk about people finding warehouses with vintage holiday stock and toys in them in Germany and Eastern Europe, but there are also a lot of reproduction holiday pieces that look a lot like the original pieces floating around on the market. This can make you wonder if the “warehouse” stories are true, or if they are made to fool people into spending more money on reproductions. Could this Krampus be a great, vintage piece? Maybe. Could he be a new piece done to look old? Maybe. The bottom line is, he is really cool looking, and I haven’t seen any others on the market to compare him to. It is probably best to error on the side of caution and say that there is a good chance that he isn’t too old, but he looks great and we love putting him on the tree. And if he is old warehouse stock, that is a bonus. There is a whole discussion that could be created right now on vintage a reproduction Christmas decorations coming out of Europe right now, but right now I want to divert into a conversation about some of Santa’s other ominous sidekicks from Europe. Before learning about Krampus I was in introduced to Knecht Ruprecht, a similar character from Germany, by one of my high school friend’s mom who happened to be a German teacher. Knecht Ruprecht is a very similar character to Krampus in that he punishes bad children, but he has a beard and looks more like a creepy and mean Santa. Another similar character is Belsnickle, who is also associated with Germany and the Pennsylvania Dutch. I think this ornament most likely represents one of those two fellows. He is just another one of St. Nick’s friends doing all of the dirty work, while Santa rewards the good kids. There are many other mean Christmas characters besides Krampus, but I think Krampus fascinates the public so much because he is so scary and disturbing. I mean, I wouldn’t want a scary old man hitting me with switches, but I would take that over a devil licking my face and hitting me with switches. 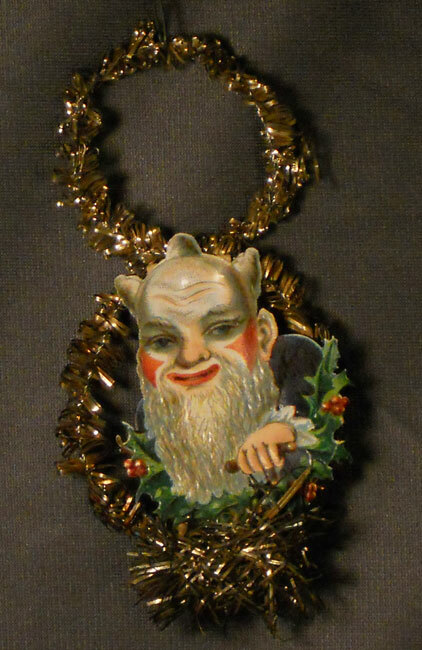 This nice early Knecht Ruprecht/ Belsnickel ornament is a perfect segue into our favorite Krampus piece, a fairly early unassuming box with a fantastic surprise. I am a little bit embarrassed to say that we did not know that this piece was most likely a Krampus when we bought it. The dealer selling it made no mention of Krampus on his price tag, and we just took it for a really neat gag gift with a devil. After several years of owning this piece, we learned about Krampus and started putting two and two together. 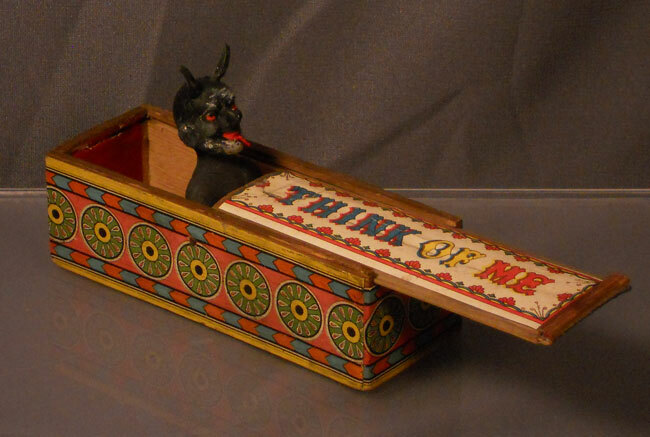 This devil head has black skin and a pronounced tongue, his box has Christmas colors on it, the sentiment of “Think of me” could mean that children should be thinking about Krampus to help remind them to behave at the holidays. 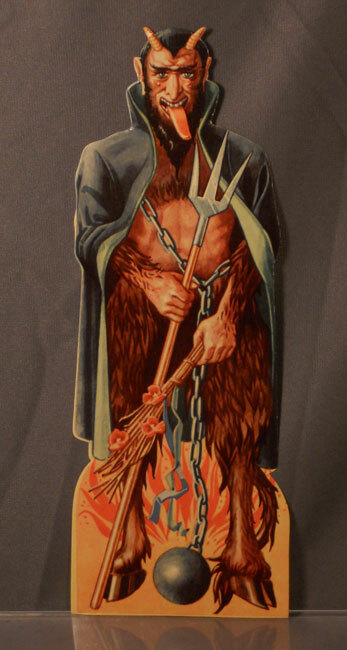 It really makes sense for this piece to represent Krampus. The one thing that throws me off more than anything is that the box is in English. Krampus didn’t infiltrate the pop culture of Americans much at all until probably within the last decade. In Europe his reign of terror was seen only really in Austria, some of Germany, and a little bit of Eastern Europe, but not English speaking countries. 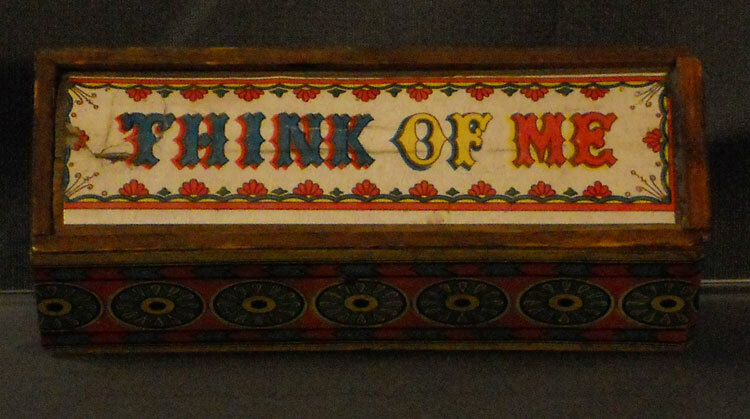 This piece isn’t marked, but is probably German, and the Germans imported a lot of decorations and toys to America. I propose that this toy might have been produced as a Krampus piece in Europe, but that they sent it to America to represent more of a novelty. It does work as such. You don’t have to know who Krampus is to see the humor in handing a person a box with a sentimental message on it, and then laughing at their shock when a devil pops out. Anyway, that is my thought on the matter. It is a great Krampus piece, and by far the favorite in our collection. …which is sold out on Etsy.com at the moment, but more will be available soon. There is always something interesting about learning about strange traditions and characters, and that is why Krampus has become a part of our holiday decor. He is just a scary little reminder to be extra nice at the holidays. This entry was posted in 1800's, 1900's, 1910's, 1920's, 1930's, 1940's, 1950's, 1960's, Amy, Art, Christmas, Dolls, Foreign, Hand Made, Holiday, Humor, Miniatures, Monsters, Toys, Weird. Bookmark the permalink. One Response to When Your Holidays Need a Little Less Cheer and a Little More Fear, Bring in the Krampus.